Cardistry is an art-form with playing cards that has become increasing popular over the past few years. Originating from magic, where magicians would use fancy moves with the cards to impress the audience, cardistry has now exploded and become a hobby and art form of its own, quite distinct from card magic. For newcomers, cardistry can basically be described as involving fancy ways of shuffling and manipulating a deck of cards to create visually amazing cuts and moves. But there is nothing basic to doing it. This art of card flourishing requires a unique skill and dexterity developed through hours of practice - and a lot of dropped cards! The uniqueness and creative qualities of cardistry, along with the ability to create a thriving community through shared resources, ideas, and videos via the internet, have resulted in it becoming amazingly popular over recent years. It has truly developed into a performance art, and attracted a fast-growing community around the world. But there are some big names at the front lines of this development, and anyone who has become a part of the cardistry community will most likely have heard of at least some of the four giants that are featured below. Let's meet a few of the real stars of this relatively new performing art. Dan and Dave Buck are household names in the world of cardistry, with an insane ability to manipulate playing cards in a creative, visual, and original way. These twin brothers live in San Diego, California, where they run Dan and Dave Industries, a lifestyle brand and design firm that produces luxury playing cards, apparel, and accessories for magicians and cardists. Now in their 30s, Dan and Dave first made their name as magicians. But not only are they accomplished magicians, but they are also at the front lines of the fast-growing and rapidly-developing art of cardistry. They branched out from magic into the world of card flourishing, where they are considered pioneers and innovators. They believe cardistry is still in a stage of infancy, much like skateboarding was in the 1980s. Its vocabulary is still starting to form, but they are convinced that cardistry will eventually become more mainstream. If that happens, they will deserve a lot of the credit for getting things started. You can see Dan and Dave featured in a number stunning cardistry videos online, and that is because they are true giants of this rapidly growing and evolving art form. They put together a series of instructional videos called "The Dan and Dave System" (2004) and later "The Trilogy" (2007), which have had a huge impact in growing the art of cardistry. Arguably no single teaching tool has had more impact on cardistry than these series of videos. Dan and Dave also appeared in the Hollywood blockbuster film "Now You See It" (2013), where their most notable card flourishes were performed by them, and then edited digitally to switch in the film's actual actors. As a further example of their impact on this growing art-form, they were also the co-organizers of the inaugural Cardistry Con in 2014. This has since become an annual event, drawing an international crowd of cardistry leaders from around the world. The Dan & Dave brand continues to manage the Cardistry Convention's official website, and is involved in each yearly convention. There's no doubt that this twosome has been, and continues to be, a massive influence in the world of cardistry. 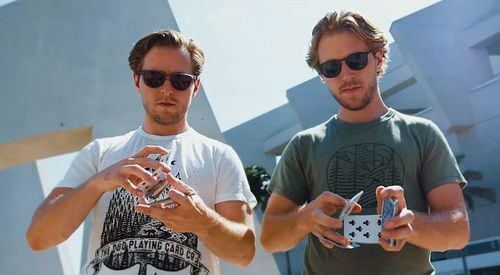 In September 2017, the Buck twins were featured by Great Big Story as part of their "Human Condition" series, and the result was a three-minute Kings of Cardistry micro-documentary entitled "Inside the Hypnotic Art of Card Juggling". This superb short video gives a good idea of what cardistry is about, and displays the kinds of crazy moves that Dan and Dave Buck are capable of with a deck of playing cards. The video's own overview gives an accurate assessment of Dan and Dave's outstanding skills, and offers some indication of the respect they have earned in the world of cardistry, with these well-deserved accolates: "Cards twirling, knuckles blazing, hands-a-blur—welcome to cardistry, the sleight of hand acrobatic sensation all done with a simple deck of 52. The kings of the cards are Dan and Dave Buck, twin brothers dealing out some of the best moves in the game. Their mesmerizing, seemingly gravity-defying flips and tricks stem from card flourishes originally used by magicians to introduce their tricks. Now, thanks to artists like Dan and Dave, cardistry has spun off as an art form all its own—keeping the magic without the abracadabra." As well as being highly regarded in the world of cardistry, and having had a major impact on its development and growth over the last few years, Dan and Dave Buck also run Art of Play. This is an online retail outlet which they founded in 2013 with the purpose of embracing the wonders of the world and connecting people through a state of playfulness, and it is also the name of their own playing card label. Seeing an opportunity, they began producing custom decks of their own. The remarkable reception that these published decks received only served to breed further success, and they have continued to successfully produce designer playing cards of the highest quality. In 2016 they produced no less than 16 original decks of custom playing cards, and they have showed no sign of stopping in 2017 and 2018, with a similar number of new and wonderful designs emerging each year, all produced under their Art of Play label, many geared especially to cardistry. Below are links to some more video clips that feature Dan & Dave Buck, showcasing some fantastic examples of their cardistry. One of these, "Avant Card", will best be appreciated with headphones/earbuds on, because this video was mixed and delivered in fully-immersive DTS Headphone:X technology. Another video is entitled "The Art of Cardistry", and is a superbly produced feature from Cool Hunting Video. The evidence is overwhelming: Dan and Dave are cardistry innovators that are still at the top of their game, and watching them perform gives a strong appreciation for the many contributions they have made and continue to make towards this relatively young and maturing art form. One of the biggest and most well-known names in the world of card flourishing is Virtuoso, or more commonly referred to as The Virts. Virtuoso, or "The Virts", is a team from Singapore that began with co-founders Huron Low and Kevin Ho. As they expanded they subsequently grew with the addition of other team members like Daren Yeow, Joshua Tan, and Jeremy Tan, as well as Joyce Lee and Roland Lim. When they first started together in 2005, Huron and Kevin were just doing cardistry as a hobby, and it was only in 2009 that they formed "The Virts" as a group. But from these humble beginnings, The Virts would soon become one of the top performing cardistry groups in the world. These guys are good. Really good. So good that one of their cardistry videos from 2012 went viral, attracting the attention of the Discovery Channel. Being featured on Discovery Channel was a big step forward, and the original video clip, "Test Room", now has over half a million views. Today The Virts have a youtube channel with over 110,000 subscribers. Discovery Channel did another feature around the time of the 2015 Cardistry Con, this time following them around and making a 25 minute documentary on the art of cardistry and on The Virts in particular. 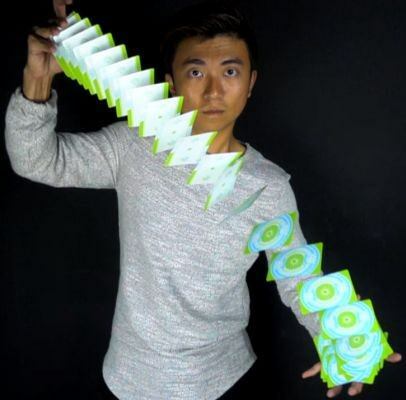 The Virts' popular videos have single-handedly inspired many to take up cardistry. But Virtuoso's success also inspired the team to embark on a new venture themselves, by creating a deck of cards designed exclusively for cardistry. And so in 2012 they turned pro, and embarked on a quest to produce a special deck of cards dedicated exclusively to serve card flourishers around the world. It was quite a risk, since the playing card market was already well established, and at that time was geared mainly towards magicians and card collectors. Would it really be feasible to create the first and only deck designed for the art of card flourishing? And was there really a market for this kind of niche-like deck? The typical trend in recent years had been to create decks that add exotic features like gold foil and ink, whereas the Virtuoso deck was stripped down of all such bling, and was deliberately designed to be much more minimalist, so the outcome was quite uncertain. Yet the response to the first Virtuoso deck was overwhelming, and even beyond what Virtuoso had ever imagined. They have continued to produce a new edition of their self-referential deck almost every year, usually featuring a different colour scheme and slight changes to their signature geometric design. The Virtuoso deck has unquestionably played a huge role in advancing the art of cardistry much further than it was 2012. At that time card flourishing was still somewhat in its infancy as an independent art form, and the label "cardistry" was yet to be coined. The Virts' Virtuoso Deck has been a real factor in this growth. Its eye-catching design has inspired many newcomers to the art, while experienced card flourishers quickly fell in love with it and spoke very highly of it. The result is that the cardistry community has continued to grow steadily as the word gets out. Furthermore, the Virtuoso deck also inspired many other designers to produce decks that were visually optimized for card flourishing, and that has helped spawn a very healthy custom playing card industry as we know it today. The Virts are not only unique because of their mad skills at cardistry, but because they were the first in the world to create a company that focused exclusively on cardistry, and to successfully produce a deck of playing cards designed purely for card flourishing. Their success has grown from their own love for the art, and remarkably there has been enough demand for them to turn it into a profitable business. As one of the team says, with a sense of ongoing gratitude and amazement, "I shuffle cards for a living." Jaspas Deck (real name Justin Ye) is the Creative Director of the New Deck Order, and has been involved with card flourishing since 2003, when he was just 15 years old. The New Deck Order was formed in 2013 by Jaspas and Loretta Sze, with a dedicated web-site that aimed to be a hub to help bring cardistry fans from around the world together. The achievements, qualifications, and skills that Jaspas brings to the table at The New Deck Order are many. He has an unconventional and creative style that immediately sets him apart from most other cardists. His impressive credentials include being crowned as the World Kardistry Champion for 2013-14, and the winner of many other cardistry competitions. He has also given lectures on cardistry internationally, and has a strong following of enthusiastic fans and students. But his wide range of skills includes academic qualifications in Fine Arts in Digital Film Making, which has been a real boon for the art. An important element of modern cardistry is the ability to showcase it with skills in technology and media, and the fact that Jaspas has these credentials serves him well to create high quality and inspiring cardistry videos. Jaspas put his skills to good use in 2013 when he created the New Deck Order's popular youtube channel, School of Cardistry, which provides free instructional videos on cardistry. This really established the New Deck Order's credibility in the world of cardistry, and put them on the map. But Jaspas Deck is not only a skilled cardist, a well-known speaker, and a gifted videographer, but has also created several decks of playing cards. In 2014, the New Deck Order team took things to the next level, by producing their own deck designed completely for card flourishing, and since then they have created several versions of their School of Cardistry deck. This deck is described as "fifty-two non-standard playing cards", and is what the New Deck Order considers to be cardistry's new standard: non-standard! The revolutionary aspect of the School of Cardistry decks is that the card faces are all identical. The abstract design on the card faces means that displays have a very unified and different look, and that not only the back of the cards, but also the faces can be used for neat presentation. Even fans, spreads, and twirls can capitalize on the face designs. With a deck like this, there is no chance that cardists with a deck in hand will be confused for magicians or poker players! The identical cards immediately become a point of interest, and set the card flourisher apart as someone dedicated to this new art form. This is definitely a deck made entirely and only for card flourishing, and its unique design helps cardistry enter a new phase of development and evolution. Jaspas has also produced several self-named decks, typically in limited editions. The first of these was described as follows: "Designed by Jaspas Deck, the Jaspas Deck features rotationally-symmetrical pips that have been repositioned to enhance spinning moves." Unlike the NDO playing cards, and despite the radical design, these do have traditional suits and numbers - although the pips are positioned and shaped to optimize how they look when rotationally twirled. Many of his are featured on his own youtube channel, and his popular cardistry vlog makes him an important voice in the world of card flourishing. With his flamboyant personality, original style, stunning videography, and unique decks, Jaspas Deck is an inventive and respected legend in today's cardistry community. Zach Mueller is the perfect poster boy for the kind of results that cardistry can produce, having first piggy-backed on the success of his cardistry videos to create a popular deck of playing cards, and ultimately a successful brand, Fontaine Cards. Youtube proved to be the ticket to fame for Zach. His own youtube channel has been around for a while, but he really went viral when Kuma Films featured him on a video with the click-bait title "Hypnotic Cardistry Kid". It now has over 2.5 million views, and single-handedly was responsible for introducing a whole new audience to cardistry, and putting Zach himself on the map. Zach's own interest in cardistry began the same way as it did for many: childhood dabbling with card magic. He was good enough to make instructional videos for Theory11, and to make his own tutorials on youtube. Inspired by legends like Dan and Dave Buck, he began transitioning towards cardistry, inventing his own flourishes along the way. He is especially noted for his isolations, which are very unusual moves that require a lot of practice - it is hard to believe how these are humanly possible when you first see them performed! 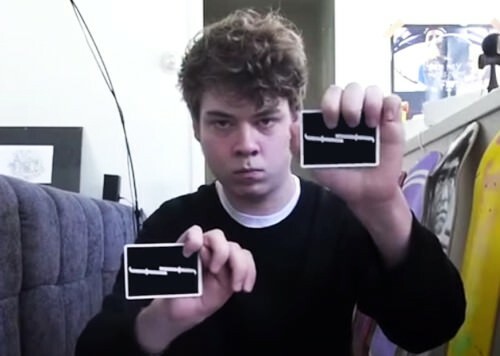 His Fontaine brand began in 2013, when Zach made his own deck of cards, with a simple mirror image of a lower case letter `f', using a minimalist style inspired by the iconic Jerry's Nugget brand. He didn't put a lot of work into it, nor did he ever plan for it to become something big. But after using his deck in several videos, he found that viewers kept asking where they could buy a deck like it. So he decided to try his hand at crowdfunding a Fontaine deck via Indiegogo. The results were staggering. After his initial effort netted him a profit of around $20,000, subsequent campaigns for the same deck design in different colours generated even more support. Zach then expanded to other Fontaine merchandise, like caps, shirts, and hoodies. The fact that he features his decks in his viral videos only helps increase demand and strengthens his brand, which today generates a six figure income. He has even been featured in a TV commercial in Japan. Today, Zach Mueller's Fontaine decks continue to be one of the most recognizable brands in cardistry. His videos still generate a lot of views, with a subscriber base heading towards 100,000, and several videos that have over half a million views each. The Fontaine decks are not really special in themselves, but certainly are a success story that shows what clever marketing and branding can accomplish, when the resources of youtube and the internet are carefully harnessed. Whether you love him or hate him for his success, there's no doubt that Zach Mueller and his Fontaine decks are one of the biggest names in cardistry today, and his unique take on this art form with his signature isolation style continues to influence and inspire card flourishers around the world. Certainly there are many other names that could be added to this list. The number of skilled cardists is growing constantly and rapidly, and you will find stunning videos on instagram, youtube, and many other places online where enthusiastic disciples of this exciting art form hang out. It is not uncommon to see relatively unknown young cardists bursting onto the scene with new moves and jaw-dropping creativity, so the future of this maturing art-form of cardistry is bright. So what are you waiting for? If you are at all into card flourishing, or even just enjoy doing a basic spread or fan, then a good cardistry deck will instantly turn even elementary moves like these into visual art. Grab yourself a nice deck, and give it a shot! You may not reach the heights of the Buck twins, The Virts, Jaspas Deck, or Zach Mueller, but everyone has to start somewhere. And you may just surprise yourself with how flashy and fun this new art form can be!